Palampur is at the confluence of the plains and the hills and so the scenery shows the contrast: plains on one side and the majestic snow-covered hills on the other side. In the backdrop of this beautiful town stands the Dhauladhar mountain range, which remains snow-covered for most part of the year. Palampur is the tea capital of northwest India but tea is just one aspect that makes Palampur a special interest place. Abundance of water and proximity to the mountains has endowed it with mild climate. ​The village of McLeodGanj, lying in the upper reaches, is known worldwide for the presence of the Dalai Lama. Dharamshala is the winter capital of Himachal Pradesh. The Legislative Assembly is at Sidhbari, near the Chinmaya Tapovan Ashram, and the winter sessions of the Government are held there. Several Foreigners have settled near Mcleodgang and city is a hub for meditation and healing centers. at a distance of 9 km from McLeodGanj, much of which is a steady climb, Triund is at the foot of the Dhauladhar ranges and is at a height of 2,827 m. The snow line, which is considered to be the most easily accessible in the entire Himalayan range starts from Ilaqua, 4 km from Triund. Bir Billing is a small village surrounded by big mountains famous for paragliding in himachal Pradesh. It is known for Hang gliding and paragliding both , which serves as a landing ground for paragliders. Bir-Billing in the Dhauladhar mountain range is known as one of the finest aero sports sites in the world . ​Their launching destination ’Billing’is at 2,400(8500 ft)on the Dhauladhar ranges and most highest aero sport site,14-km distance from bir. Bir billing is one of the nature wonders. Has become a legend on the international paragliding circuits and a destination for world champion paragliding pilots. The green meadow directly above the villages of Bir and Chaughan,is one of the best gliding sites in the world. The massive Dhauladhar mountain range and the kangra valley below with its panoramic views offer opportunities for high altitude’up and down’and ‘all over the world flying for more than 200-km. The town has a range of outdoor activities, including a trout breeding centre from where fish are released into the Uhl. A 30 km section of the river is used for angling fishing. 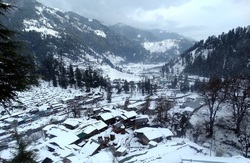 ​Barot also forms the gateway to the Nargu Wildlife Sanctuary which lies across the Uhl. The sanctuary is home to the monal, black bear and ghoral. Within it are forest rest house s at Thaltuckhod and Silbandhwari. The Dalai Lama found Dharamshala in Himachal Pradesh as an ideal place to establish his “capital in exile” at McLeod Ganj in close vicinity to Dharamshala, and is called the Little Lhasa and also as Dhasa (a combination of Dharamshala and Lhasa in Tibet). This situation has given the state a unique status in the global firmament of Buddhist traditions. It is now the cradle of Tibetan Buddhism, with its undeniable link to the past activities initiated in the 8th century (in 747 AD) by Guru Padmasambhava. Six of the top monasteries in India are situated in Himachal Pradesh, 4 of them in Kangra District alone. 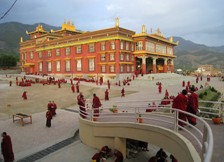 So If you want to explore Buddhism and Spirituality, look no further, be it learning Tibetan, or practicing spirituality, meditation or watching breathtaking museums and monasteries, HolidayDada is the place to be. Read More..